When it stops being a smartwatch it'll work as a regular watch. The V40 isn't the only new trick up LG's sleeve this fall. Also on tap is the LG Watch W7, the company's first smartwatch in 18 months. It's a new sort of hybrid that promises extra-long battery life. We've seen plenty of hybrid Wear OS smartwatches from the likes of Fossil, Misfit, and Nokia/Withings, but the W7 puts a unique spin on the concept. Instead of a small screen for steps and mini alerts, LG's new wearable has a full 1.2-inch screen that runs Wear OS 2.1, so you'll be able to use apps just like you would on a normal smartwatch. What makes the W7 a hybrid is a pair of ever-present mechanical hands. That means you can tell time even after the battery can no longer power the full smartwatch screen. The W7's 240mAh battery isn't that big, but LG promises a whopping 100 days of use, if you count non-smartwatch use. When the screen is on, the W7 is a standard Wear OS smartwatch. And not a new one. It's still using the long-in-the-tooth Snapdragon 2100 rather than the newer 3100, and it's missing GPS and NFC as well. But as an interesting concept, it scores huge points. The LG Watch W7 will look like a mechanical watch from a distance. The main point of the W7 is that it can be worn as a regular wristwatch—as in, it tells time—for more than three months. LG says the full smartwatch features will last for two days, and you'll still be able to squeeze a couple days of watch use out of it after the screen dies. 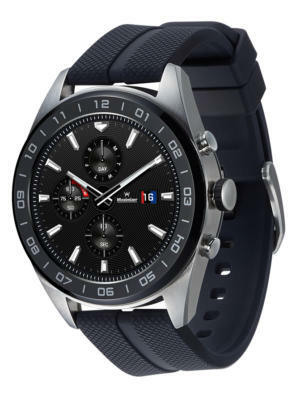 It has 4GB of on-watch storage for music and apps, as well as the usual array of sensors: accelerometer, magnetic, gyro, pressure, compass, altimeter, and barometer. It's also equipped with IP68 water resistance and is compatible with any 22mm band. But what will draw people to it are the mechanical hands. 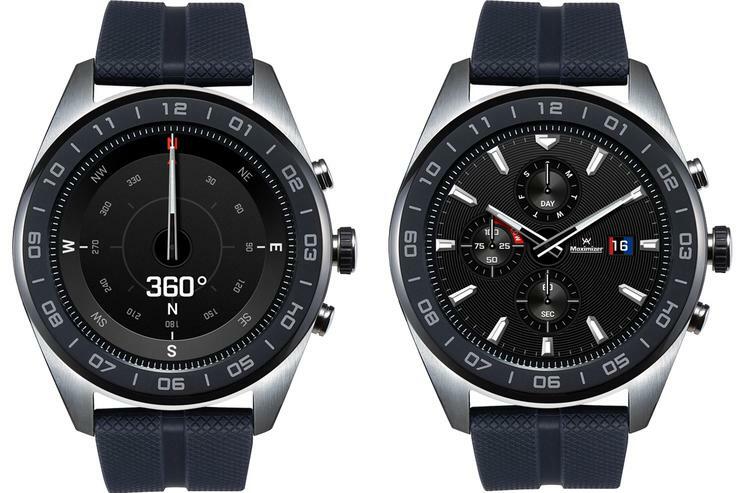 LG partnered with Swiss watches maker Soprod SA on the design of the W7, and the influence is clear. There's an understated elegance at play that shines through both the digital and analog features. At 44.5 x 45 x 12.7 mm, it's a bit bulky, but it's much less cumbersome than the LG Watch Sport, which clocked in at a massive 45.4 x 51.21 x 14.2 mm. Because it's always operating as an analog watch, LG has designed the W7 with a numbered bezel circling the screen. That's a common design element for a smartwatch, but this is one of the few watches where it makes sense. If you're questioning whether the hands will get in the way of reading a text or seeing important info on the screen, LG has thought of that. When in an app or a notification, the hands will either position themselves at noon or 9:15 to let you see the text beneath. And if they're still in the way, the screen will shift up or down to give the words more visibility. I haven't been able to see it in action yet, but it's definitely a feature that LG needs to get right for the W7 to be a success. The LG Watch W7 will be available for pre-order at Best Buy beginning Sunday, October 7, for $450. It will hit shelves beginning October 14, but LG hasn't announced where other than Best Buy.